Turn off the busy road that hugs the coast between Weligama and Galle, travel a mere 5 kilometres and enter a different world. Here Kahanda Kanda sits on a ridge in an atmosphere of utter peace and tranquillity looking down towards Koggala Lake. 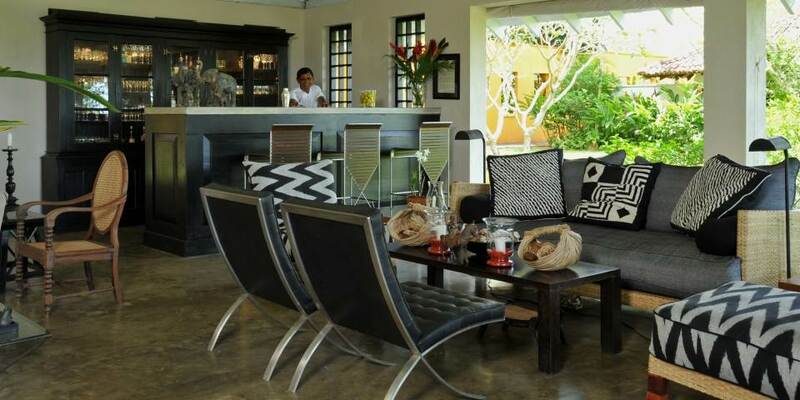 Meals are taken in the Dining Pavilion close to the pool with mealtimes entirely at the guest’s discretion. Fruits, vegetables and herbs, all grown on the estate are supplemented by the freshest local produce to create simple fusion dishes and classic Sri Lankan curries; with two of the three chefs having trained in Thailand mouth-watering Thai food may also be seen on the menu. Breakfast has a selection of local specialities as well as Western dishes, lunch can be three courses, or just a snack. Dinner is a gourmet affair and for those would like a romantic dinner, what could be better than a table set up in the garden for supper under the stars? Wander through the 12 acres of Tea Plantation and visit the nearby tea factory and learn how this staple drink is transformed from bush to cup. Hire a bike and discover the local area, maybe hire a boat on Koggala Lake which is alive with birdlife and dotted with islands. Just 15 minutes away the sandy beach is perfect for a lazy afternoon, or venture further and experience the historical Galle Fort. 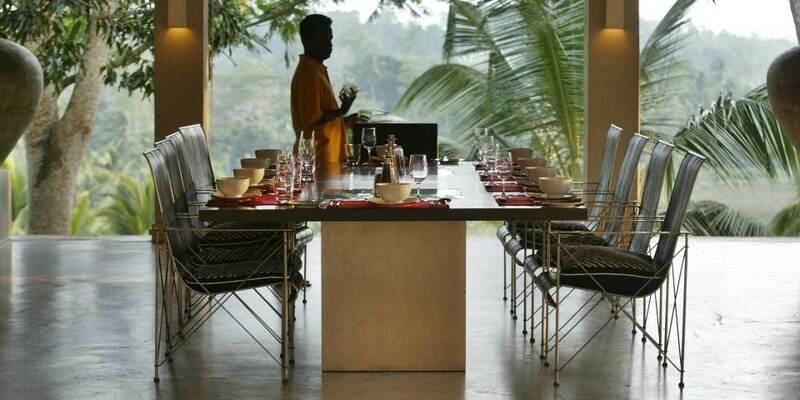 Return to Kahanda Kanda and uncover the secrets of Sri Lankan cuisine with a customised cookery lesson. For those who just wish to relax the beautiful pool awaits or the more active may wish work out in the gym. The stresses and strains of sightseeing could soon be dispelled by the resident masseur, who administer relaxing body massages in a pavilion, nestled in among the tea plantation with a view to die for. Each of the 8 suites is individually furnished and decorated, with polished floors crisp linens, four poster beds, a mix of contemporary and antique furniture together with huge luxury bathrooms. Tranquillity is assured as none with the exception of Dubu has either television or DVD player. 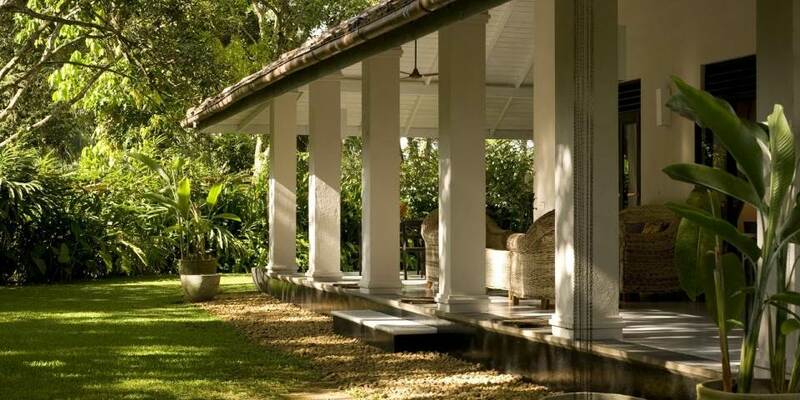 The Tea and Garden Suites are set around a huge terrace and would be ideal for a family or group of friends. Glimpsed beyond the saffron wall close to the Living Pavilion are four more suites, Tamarind decorated in shades of blue and with a private terrace, Mango with a huge verandah overlooking the tea plantation, Auraliya with cool linens double showers and hand basins and a large verandah overlooking the Tea Estate and finally Peacock; with crisp black and white décor and two full bathrooms all complemented by a private courtyard garden where peacocks may be seen and stunning views over Koggala Lake. Honeymooners should choose Hellaconia, away from the world beyond the vegetable garden in its own private garden. 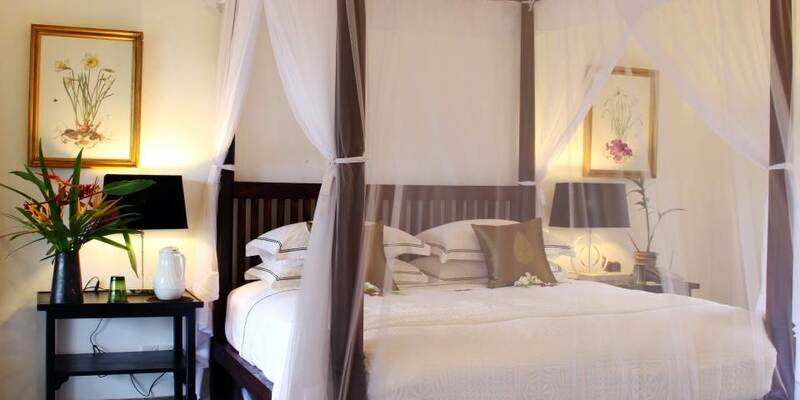 For sheer luxury it is hard to beat Dubu, a wonderful original Javanese house brought to Sri Lanka and totally furnished with Javanese furniture, with two separate outdoor bathrooms. 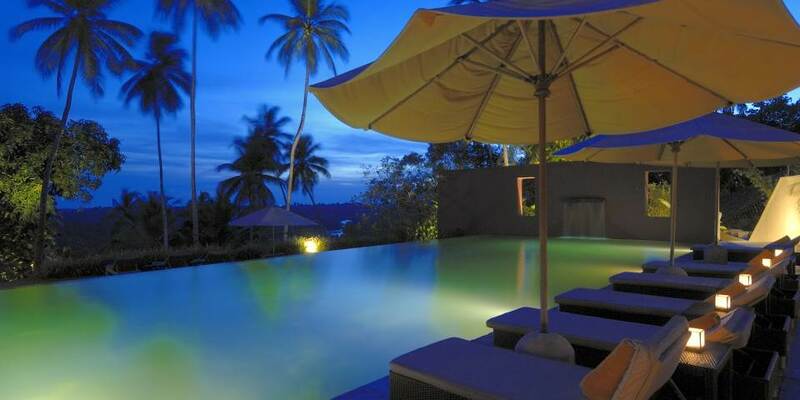 Surrounded by gardens and with a private swimming pool it is the perfect hideaway.